The Irvington Skill Share Feastival is coming up Nov. 7, promising "down to earth skills from garden to kitchen." Locals will share their experiences with canning, beekeeping, bread-baking, composting -- everything you need to know to have your own little urban homestead. The event, which is part of the Spirit and Place Festival (more on that later), will be held from 1-5 p.m., Nov. 7, at Irvington United Methodist Church. I just put it on my Google calendar, so I'll see you there! The harvest season is upon us, and the Indiana State Museum is celebrating with a variety of classes and activities. Oct. 2-3 = Harvest Jubilee. Workshops include making gourd birdhouses, extending the growing season, and finding local food in Indianapolis. Don't miss the Hoosier Farmer's Breakfast at 9 a.m. Oct. 2 ($17). Oct. 9-10 = Crocked, Sauced and Pickled. Learn how to make your own refrigerator pickles or create a fall wreath. Afterward, snack of local jams, jellies and preserves at the Farmer's High Tea, at 3 p.m. Oct. 9 ($12). Oct. 16-17 = Urban Fresh. Workshops include composting 101, DIY rain barrels and spring garden planning. Celebrate with the Farmer's Chic Buffet, at 11 a.m. Oct. 16 ($17). Cake decorating is not my thing. For one thing, I can't stand the taste of cake. If forced to choose between eating a cake or licking a tire, I would gratefully choose the tire. Still, I signed up for today's fondant class at Frasier's Gourmet Foods because I wanted to learn something new, and because I'm enjoying the classes taught by chef Justin Miller. I'm starting to see a lot of the same people in each of his classes, and we're developing a nice camaraderie. Today's class was limited to just eight people, which allowed for a hands-on lesson. It was a bit more expensive ($45 instead of the usual $35), but for a topic like this one, the practice was invaluable. 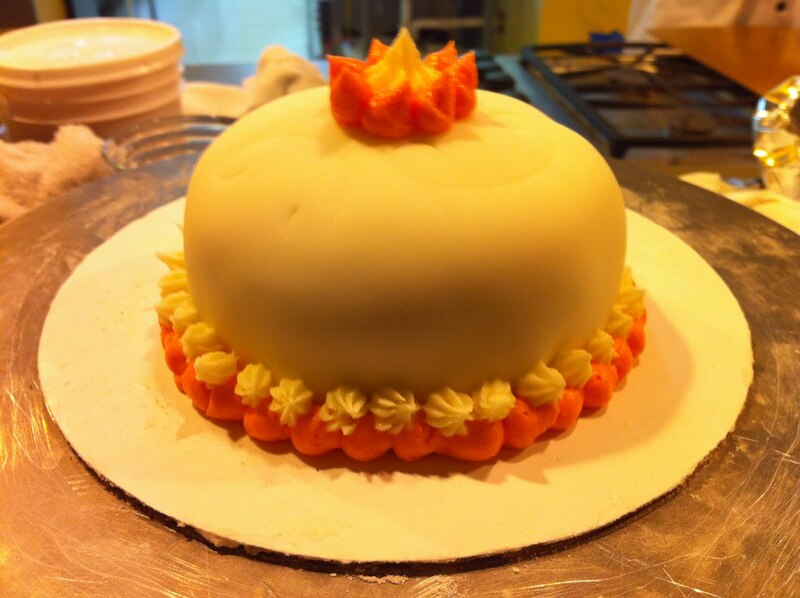 Miller explained how to do a crumb coat, how to use butter-cream icing and fondant, and how to pipe a few basic designs. I admit, a blind-folded monkey could probably beat me in a cake-decorating contest. But I had a good time tonight, even though I ate enough icing to make myself ill (or maybe because I ate that much icing). Intro to Upholstery Workshop: This is a two night class in which you will learn the very beginnings and basics about upholstery tools, measuring your furniture to determine fabric yardage, tear down, re-padding and upholstering a SIMPLE piece with fabric. Suggested pieces: flat benches, slip seats or an easy side chair. Pre-approval needed. I will show you how to tear down your piece, re-pad it or fluff up the old padding, cut new fabric, plan the layout of the fabric and upholstering your piece. We will do as much as we can during these two 2 ½ hour sessions. If you bring more chair seats than we can complete, you’ll know how to complete the rest of them at home. New foam and fabric not included. Tools are available for you to use. This class will give you the confidence to move on to a more detailed piece of furniture. Build Your Own Custom Ottoman: This is it! You will learn the basics of building a piece from the ground up in this one day, four hour class. We will be webbing a pre-made frame, cutting foam, applying the top layer of dacron padding and upholstering the ottoman with fabric. We will also be making welt cord to add to the bottom edge of the ottoman. You will need to purchase wood furniture legs to attach to your ottoman. (you can either bring your own or purchase a variety of legs from me. Class: $90.00. Tools are available for you to use. Intermediate Upholstery: This is the next level for students who have learned the basics and are ready to tackle a more detailed piece of furniture. In this 6 week class we will hit the ground running to get your small upholstered chair completed in the 6 week time period. No wing chairs, lazy boys, big lounge chairs. You can learn all you need to know on a small upholstered piece. The skills you learn will translate to larger pieces. Stop by the Indianapolis Art Center this Friday, 6-8 p.m., for the fall open house. Taste free samples from Yats, Qdoba and the Broad Ripple Ice Cream Station, and listen to a steel-drum performance by Tom Berich. Even better, the classrooms will be packed with demonstrations and hands-on activities, including pottery-making, jewelry-making (fusing and forging metal) and print-making. You can even create your own watercolor painting with the help of an Art Center instructor. Don't want to make your own art? Buy unique pieces at the gift shop sidewalk sale and browse creations by Art Center students and faculty members. Whatever you buy, the proceeds will support local artists and one of the city's best venues for lifelong artistic education.